These items include ladies pockets, reticules, blackwork collars and cuffs, fur-lined muffs, and just about anything you can imagine. By whatever name you call them, our head coverings are unique and spectacular. From the German unterhaub to medieval hoods; Elizabethan coifs to Viking headscarves, we can cover your head. Contact us to place your order. Want to add that special touch to your shirt or chemise? Our blackwork embroidery designs are available for shirt & chemise cuffs and collars. Designs are supplied on bleached white cotton unless otherwise specified. Colors, bleached and unbleached linen, linen-like and cotton are available upon request. In addition to blackwork, we can do other colored work including gold. Each set is $15.00, and includes four strips designed to trim or sew together to fit any size neck or wrist. Contact us for current availability or special orders. Men started using pockets in the mid-1500's. Ladies are documented as wearing detached pockets in the mid-1700s and remained in use for nearly 100 years. However, some artwork shows ladies wearing decorated pockets as early as the late 1400s. Our pockets are based on existing designs found at the Victoria and Albert Museum. These lovely, detailed detached pockets are traditionally worn over or under ladies skirts and fastened at the waist by ribbons. Please specify waist measurement and colors of embroidery, trim and ribbons when ordering. 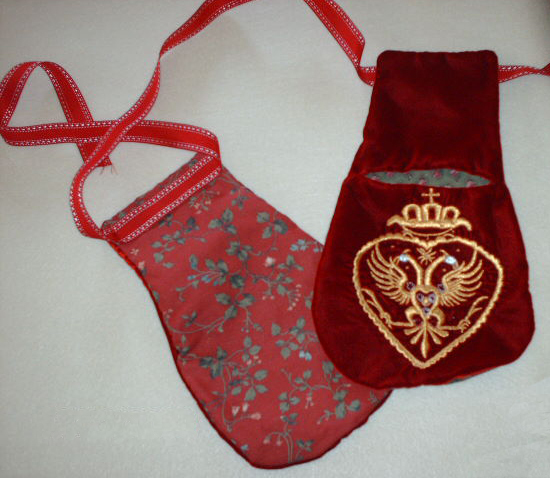 For centuries, women have carried small items such as sewing kits, notebooks, and other miscellany in small bags. These bags have gone by many names, but all were a reflection of the lady's talent in stitchwork. We offer bags in many styles, colors and sizes to enhance your look. Contact us to create your unique design. Our fur-lined muffs are a must on a chilly day. Complete with the design and color selection of your choice, each muff has a hidden pocket perfect for a coin purse or modern hand warmer. Looking for a specific style (Regency, 1880s)? We can outfit you in style for any era. The standard muff is lined with rabbit fur for soft, natural comfort. Other furs are available. Please contact us to create your personalized hand warmer.